The real achievements of the tunnel were beyond human imagination. Just going under a tunnel section, you will understand why the small Vietnam could gain victory over the enemy, a big country and the world's richest. Why Cu Chi, the poor land was able to cope uninterruptedly for 21 years with a much larger army, warlike, equipped with modern and updated weapons and means of warfare. In this battle, Cu Chi people and soldiers had gained resounding victory. During these years of fighting against the French (1945-1954), the soldiers hid under the secret bunker in enemy territory, protected by the people. The tunnel secretly constructed in many ways, but mainly underground, .only .one cover large enough to get in and out, and a vent to breathe. When the cover was closed, it was difficult for the enemy to detect the bunker. In enemy territory, the soldier stayed in the secret underground bunker in daytime, in the night, he got out of the ground for operation. But the disadvantage of the secret bunker was that upon being detected, it was easily controlled or killed by the enemy as they were more crowded with more advantages. Due to that, it was thought necessary to extend the secret bunker into the tunnels and .onto the ground with many secret doors to both shelter and fight against the enemy, and when necessary, to escape the danger to anywhere else. Since then, the tunnel was born with the special significance in combat operations, working for the soldiers and people in the outskirts of Saigon - Cho Lon - Gia Dinh. 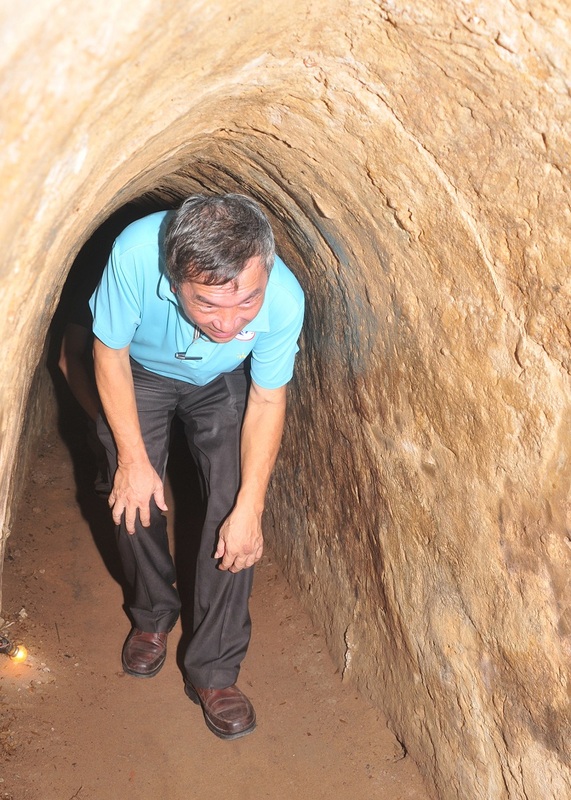 In Cu Chi, the earliest tunnel appeared in 1948 in two communes of Tan Phu Trung and Phuoc Vinh An. At first, there were .only short and simple structured sections, used to conceal documents, weapons, hiding soldier’s opearting in enemy territory. Later, it spread to the communes. From 1961 to 1965 the guerrilla war of the people in Cu Chi had grown rapidly, causing huge losses to the enemy, contributing to defedt the strategic "special war" of the American. 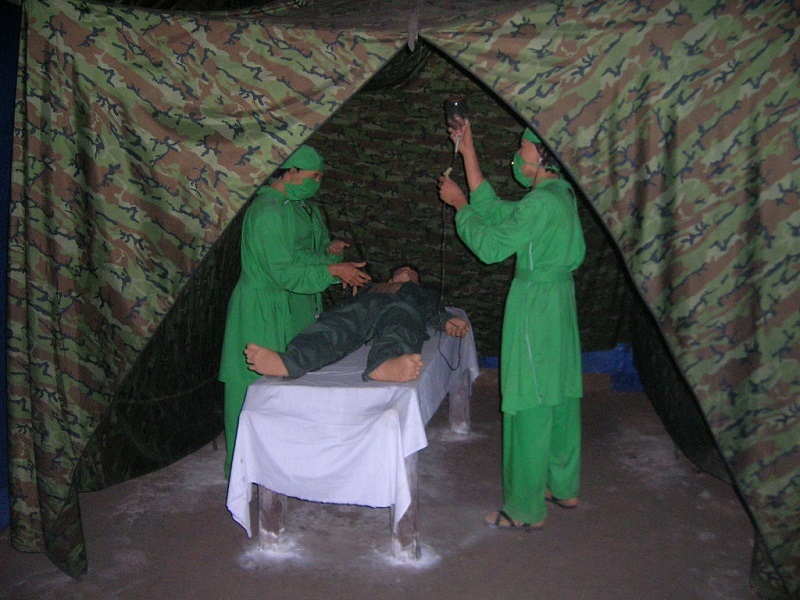 Six communes in the north of Cu Chi had completed the "backbone" tunnel. Then, the agencies and units developped branch tunnels connecting with the "backbone", an interconnected tunnel system. Entering the era of figting against American imperialism in Vietnam, Cu Chi Tunnel thrived widely, especially in the beginning of 1966, when the US used infantry Division No. 1 " Red Brother " and performed major operations named crimp, sweeping, raiding bases, and the next, putting Division 25 "tropical lightning" to establish Dong Du basement, consecutive sweeps, fiercely attacking the revolutionary forces here. Before the fierce attack of the America - puppet with barbaric destruction war, Commissioner Saigon - Cho Lon - Gia Dinh area, Cu Chi District’s Party Committee led the people and the armed forces determined to manage to fight, destroy enemy defense and homeland security, protecting the revolutionary base areas of strategic importance, the approach and process for major attack to Saigon puppet’s headoffice. With the slogan "not an inch away, not a glass leave," the army, militia, political parties and civil authorities and the people tried to emulate digging tunnels, trenches, fortifications around the clock, regardless of any bombs, rain or sun, actively building "hamlet fight" to set "kill Americans belt" firmly into the defence, the attrition process, destroy enemies. The movement of digginh tunnels increasingly thrived, stayed strong everywhere, the old and the young, boys and girls participated with excitement to establish fighting tunnel. The strength of the human will was able to any difficulties. .only by means of very primitive tools: hoe blade and the bamboo “ki”, Cu Chi soldiers and people have made a great work with hundreds of kilometers along the horizontal tunnel in the ground, connecting the hamlet together as a madic "village". .only the transfer of tens of thousands of cubic meters of soil to somewhere else to keep secret, was something extremely arduous and meticulous. Someone asked where to hide such a large land mass? The answer is that there are many ways: pump into bomb holes, submerged up into termite mounds, shed plowed fields, grow plants .on the ground ... .only a time to lose the trace. All the family in "belt" the area dug trenches connecting into the tunnels, creating continuous production to fight and to keep the village. Each individual is a soldier; a tunnel is a fortress fight. Exactly .one year after the Crimp raid, dated January 08th, 1967, the US military launched the Cedar Falls military operation in "iron triangle" area, aimed at destroying bases and destroying the revolutionary forces. This time, the tunnel system had reached the total length of about 250 km. Cu Chi Tunnel was not passive but proactive to fight in the battle with landmines left thick .on the ground, to become a daily threat to the enemy during the war. The tunnel system runs squirming in the ground, from the "backbone" (Main Street) spreading numerous branches of diferent lengths, connecting together or independently end, depending .on the terrain. There are many branches to Saigon River, so in emergency case, they could cross the river to the base of Ben Cat (Binh Duong). Around the covers of the bunkers, there are many nail holes, mine left (called dead area), including anti-tank landmines and cluster bombs against wheels helicopter shooting down, to destroy and prevent military enemy approaching. 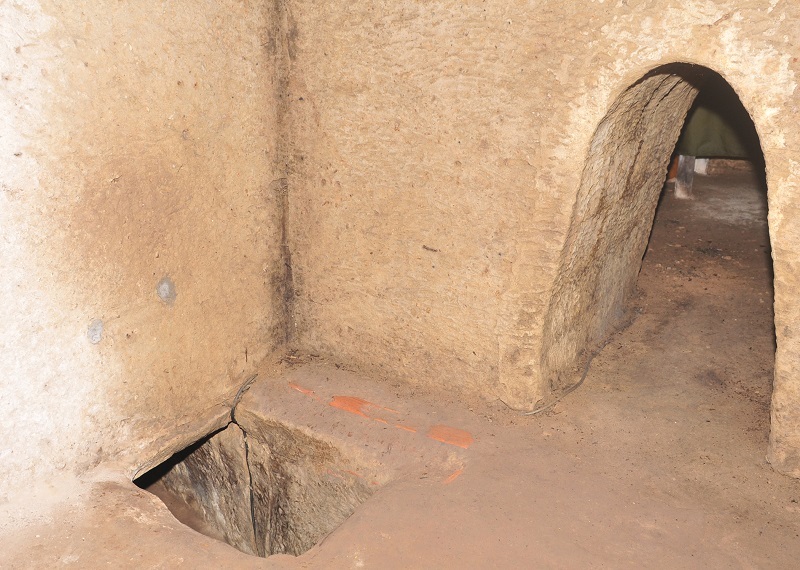 At the time of fierce raiding, all activities of combat forces and activities of the people are "hidden" underground. In arduous conditions, peple were still trying to create a normal life, despite the ground plowed relentlessly bombing, smoke and fire ... but in reality, life in the tunnels was extremely arduous, the story of unwilling . Due to conservation of forces to fight in long time, people had to accept all the rigors beyond human endurance. As in the dark, cramped underground, the travel was very difficult, mostly bending or crawling away. Tunnel was wet and stuffy due to lack of oxygen, light (light mainly from candle or flashlight). Whenever a person became fainting, it was necessaty to get out for CPR to regain consciousness. In the rainy season, the ground had more harmful insects, even snakes many where... For women, life was even more difficult. To have a baby and raise the children in the basement tunnels was to suffer so much misery. Not .only this, hundreds of people up and down the tunnel every day to keep secret tunnels was a very complicated story. A broken grass, soiled land, a torn leaf unusually needed remodeling, otherwise, the enemy could detect and attack. Right from the beginning, when the US invaders entered Cu Chi, they had faced fierce resistance of the soldiers and the people here. They were damaged .on the people and war vehicles in the raid to liberated areas. After the suddens, they realized the fighting force coming from under the tunnel, and determined to destroy the tunnel system. Combined with tunnel destruction, destroy the bases to knock away the revolutionary forces, creating a safety belt to protect Saigon headquarters of American - Puppet, also the capital of the puppet government "Republic of Vietnam". 1. Use water to destroy the tunnel: In an operation called Crimp (trap), from January 08th to 19th, 1966, the US mobilized 12,000 troops combined with the air force, tanks, newspaper infantry to attack liberated areas north of Cu Chi. The enemy used water pumps into the tunnel, thought that the enemy would be overwhelmed to emerge ground water. When detected hatch in remote places of Saigon River, they used a helicopter hoisting each sitet water to flush into the tunnel. With childish tricks, the enemy could not achieve success as their intention. They could not afford to make the tunnels flooded with too little water, just enough for infiltration into the soil. According to the enemy, they just destroyed 70m tunnel, some too small compared to the tunnel system with hundreds of kilometers. In contrast, during the raid, US forces were hit by soldiers, guerrilla from all sides, day and night, causing 1,600 casualties name, 77 tanks and armored vehicles destroyed, 84 aircraft were shot down. This was a great loss for US forces in military operations "trap". It proves that people's guerrilla war was likely to defeat American modern warfare. Despite the defeat, the enemy continued to attempt to destroy the tunnels. They gave some military experts to directly investigate Cu Chi Tunnel system, but not guaranteed conditions for a thorough investigation, plus the subjective mind, relying .on modern weapons, this brought no results; the next tricks, .once by bine went bankrupt and they got more and more severe loss. 2. Use the “rat” army to attack the tunnel: Cedar Falls In operation, known as "Shelling earth" opening from January 08th, 1967, the enemy mobilized 30,000 troops backed up with tanks, Coins armor, artillery, air force, attacking fiercely into the "iron Triangle", in which they destroyed towns of Ben Suc (Ben Cat) and severely undermined 6 communes to the north of Cu Chi district underlain in the dense tunnel network. During the raid, the enemy armies using "rat" of 600 infantry soldiers selected the name "little people" in charge of destroying tunnels. Before opening sweeps, they used "Flying Fortress" B.52 and jets bombs combined with continuous artillery strikes for months, in order to "clear grounds" for landing helicopters and tanks, infantry attack .on the base. They used the napalm which burned hundreds of hectares of forest and gardens. Bulldozers cleaned the woods and put the tree back, pouring the gasoline to burn. There were 4 "rats" each group, two .on the ground, 2 crawling into the tunnels (which they discovered as the soldiesr had moved to another location) equipped with gas masks, rifles, fast, dagger, oblong iron plant, blowers Sliding Agent, flashlight .... Meet the tunnel junction; they put mine there, putting the wire .onto the ground and "firing" for mine explosion blowing the tunnel. By this method, the enemy destroyed some short tunnels, but nothing compared to the hundreds of km tunnel interlaced many sections, many corners interconnected with each other. Infantry tactics used to destroy tunnels fails. During this raid, the fighting forces and people managed to stay and fight back fiercely, defend the Command, the leaders of the District Commissioner and the majority of the base. Anywhere the enemy wnet, the soldiers from the mounds and trenches fought them in every form, every weapon. At the junction of Ben Duoc (now ruined), .only .one team with nine guerrilla fighters, including .one nurse, had to stay continuously for several days, killing 107 enemy soldiers, shooting their tanks. Cedar Falls Operation suffered heavy losses double than the Crimp raid and must end sooner than expected (to take .only 19 days). These "cast mines" by Hero To Van Duc were used throughout the battlefield, contributing to destroy hundreds of motor vehicles and helicopters, infantry America, repel evil footsteps of the enemy . For the Cedar Falls, the enemy lost 3500 people, 130 tanks, armored vehicles, 28 aircrafts. The goal of the US was not achieved, as General A. Nasen confessed partly: "The survey said rights after our troops have withdrawn from the" iron triangle ", the Vietnamese Communists broke into first". After all, the US must admit bitterly: "... cannot destroy the tunnels because it is not .only very deep, but alos extremely winded, not straight anywhere... inefficient to use sappers ... and very hard to find the hatch to down the tunnel ... ". 3. Use Becgie dogs raiding the tunnels: In the raid, US forces used guided hunting dog Becgie to detect tunnels. Approximately 3,000 children are mobilized into action Cu, Ben Cat. This breed of West Germany, sniffing the very best and trained "professional" before going to Vietnam. Using military dog tricks made it difficult and dangerous for the guerrilla army, because the rising steam vents and hatch were easy to find by dogs. At first, guerrillas shot dead dog, as the enemy detection, focused raiding. Later, the soldiers puree mixed with dried chili pepper powder sprinkled .on the vents, but not okay for dogs inhaling pepper coughing caused the enemy to detect tunnels. The work quickly became complex. The units encouraged people to make suggestions to fight against the dogs, finally figured out how to disable the large army dog, the risks and benefits. According to the announcement, in the campaign using dogs in Cu Chi Tunnel, 300 dogs were sick and killed by guerrillas. Thus Becgie dog tricks used to detect the tunnels of the US military went into failure. In these days, despite the US military collaboration with the army .onslaught, the revolutionary forces still remained in the tunnel, living and fighting, destroyed much of the enemy’s sources. Not achieve the desired results, the enemy had to abandon this strategy, because they could not afford to destroy out all the tunnels while the troops and guerrillas were fighting back all day and night. 5. Sowing grass for terrain clearance: The enemy also used many tricks to destroy the tunnels and bases, but notably is the trick of sowing grass terrain clearance. They used aircraft spraying a strange species, Cu Chi people knew as the "American grass". This grass grew very fast, just a month achieved high as 2-3 meters, sharp and as bis as the chopstick. The other plants are overwhelmed and could not develop. The grass in the forest made it difficult to travel, combat maneuver, but easy to detect targets from enemy aircraft, to bombardment. After the offense and uprising in Tet Mau Than, morphology of the battlefield had changed. The enemy out strategy "sweep and hold", open continuous operations, fiercely counter-attacked and swept Cu Chi’s liberated areas, in order to dislodge the revolutionary forces away, creating safety belts to protect Sai Gon. The tunnel was also trying to create and develop firmly for the forces to approach suburban areas, hold the area, ball up new opportunities to prepare for the liberation of Saigon later. Until the spring of 1975, several large military groups of Corps 3 and army units, locals gathered here toenter liberate town of Cu Chi and last stronghold of the enemy in Saigon, ending the war against the US, at 11 am .on April 30th, 1975. By the Civil War's extremely various and innovative, over twenty years of fighting tenacity, people and soldiers of Cu Chi hit 4269 small and big attacks, collected 8581 firearms, defeated more than 22,582 enemies (more than 10,000 Americans, 710 arrested), destroyed more than 5168military vehicles (mostly tanks and armored vehicles); shot down and beaten down 256 aircraft (mainly helicopters), sinked 22 ships and boats, and destroyed 270 military posts. Being titled by the National Liberation Front of South Vietnam: CU CHI LAND OF STEEL AND COPPER WALL. Being honored twice by the Government of the Socialist Republic of Vietnam with the title: HERO OF THE PEOPLE'S ARMED FORCES. Up to now, Cu Chi district is honored: 19 Hero communes, 39 People's Armed Forces Hero, 1277 Vietnamese Heroic Mother, 1800 appointed as valiant, awarded two City Council Medals and more than 500 national and Military Medal, Victory of different grades for the collectives and individuals. The war has left serious consequences for Cu Chi, especially the tragic loss of life and poverty in the years after the liberation. Today, the "white zone" has revived intensely. .on the Tunnel now is the green fields and crowded villages. The sworks for livelihoods are growing round the wounds of war. 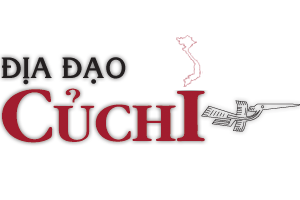 Cu Chi is innovativing and going to socialism, with strong agricultural structure, .one of th ekey rice and food regions of Ho Chi Minh City, also the solid military fortress to protect the city in the north-western gateway. 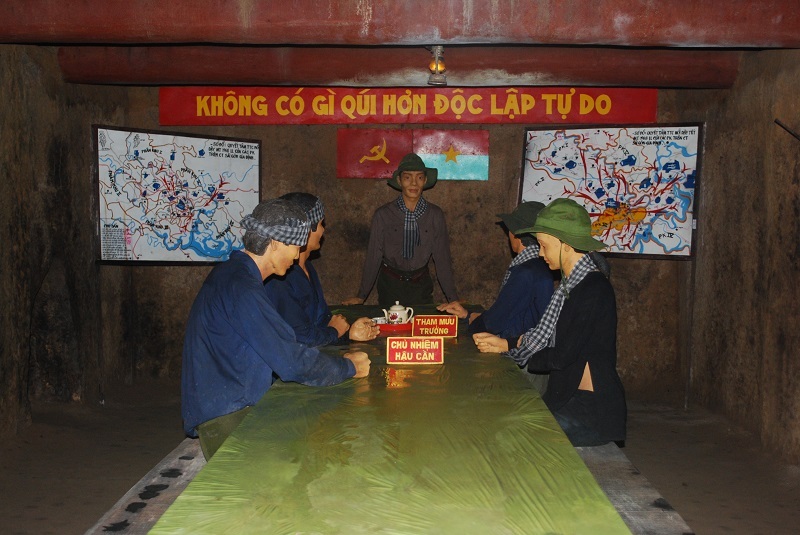 With the value and victory scale gained with bloodshed, efforts of thousands of soldiers, people, the basement of Cu Chi tunnel was recognized by Ministry of Culture as the National Culture- History Monument. Cu Chi Tunnel quickly attracts the attention of everyone.Visitors in and outside the country come to visit and learn more and more crowded. Cu Chi Tunnel becomes a traditional destination of Vietnam generation and respect of friends in the world. From the day of peace, there were tens of thousands of tourist group with millions of all color, race all over the world, who came to visit Cu Chi Tunnel. From the General Secretary of the Communist Party, the Head of State, to politicians, generals, scientists, philosophers, writers, journalists, Veterans ... had entered the tunnel with all emotion and admiration for the heroic land. A politician in the German Federal Republic said: "For many years I have suspected the struggle of the people of Vietnam. How can a small and poor country defeat a large and wealthy country like the United States? But coming here, go through the 70 meter tunnel, I was self-answering that question. " 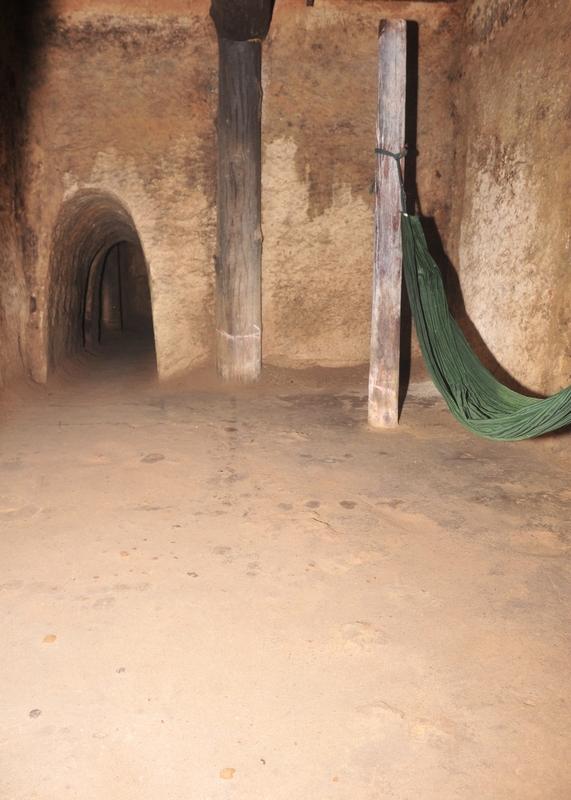 - Ben Duoc Tunnel (Committee Area basement, Command Ministry of Saigon - Cho Lon - Gia Dinh Military Zone) in Phu Hiep Hamlet, Phu My Hung Commune, Cu Chi District, Ho Chi Minh City, recognized by Ministry of Culture - Information as National Historic Site under with Decision No. 54 / VHQD April 29th, 1979. 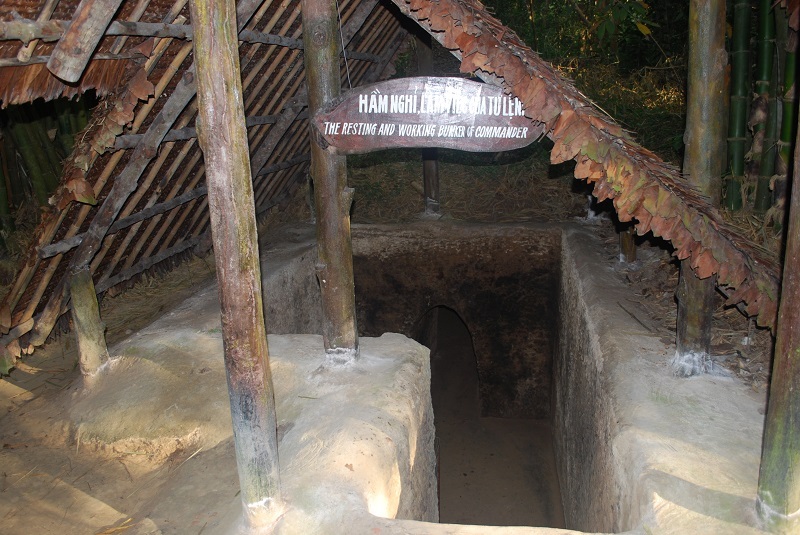 - Ben Dinh Tunnel (Cu Chi District Commissioner basement) at Ben Dinh Hamlet, Nhuan Duc Commune, Cu Chi District, Ho Chi Minh City, recognized by Ministry of Culture - Information as National Historic Site in under Decision No. 101/2004 / QD-BVHTT .on December 15th, 2004.